Der Objekt 430U ist ein sowjetischer mittlerer Panzer der Stufe 10. Das Objekt 430U ist eine Ausführung des mittleren Panzers Objekt 430 mit hinten liegendem Motorraum und Antriebsstrang. Diese Version sollte einen querliegenden Motor und zwei Planetengetriebe haben. Diese technische Lösung erlaubte, den Innenraum zu vergrößern und das Gewicht des Fahrzeugs zu reduzieren. Dieses Fahrzeug wurde zwischen 1953 und 1957 entwickelt und sollte den T-54 ersetzen, die Arbeit wurde jedoch 1961 zugunsten des Objekts 432 aufgegeben. This tank is literally a "Heavy medium" tank with various characteristic from heavy tank and medium tank mixed together. it had fast speed that's not as fast as other mediums, very good protection that's not as good as other regular heavies. and acceptable gun handling. it's best played as spearhead tank that can lead a charge to enemy's front, or as anti-mediums that can fight well against enemy's light/mediums with your protection and mobility. Der Objekt 430U markiert das Ende seiner Linie sowjetischer mittlerer Panzer. This vehicle comes elites in its stock configuration. Object 430U (“uluchennij” – improved, or “usilenij” – strenghtened) was – although designated a medium tank – a Soviet take on how heavy and heavily armored a Soviet medium tank can get. It was (as the name suggest) a development of the Object 430 itself, but with improved armor and a 122mm D-25T gun. 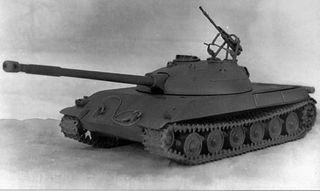 In 1954, the construction bureau of the Kharkov plant No.75 made another medium tank preliminary project on its own initiative, under the designation of Object 430U. The frontal hull armor was improved to 160mm (120mm on original Object 430). The turret was also reworked in order to improve its protection and to install the 122mm D-25T gun (some sources suggest that a 130mm gun was also considered). Suspension was also reworked and the weight of the tank increased from 35,5 tons to 42 tons. In a number of parameters (ammunition rack, ground pressure, power-to-weight ratio), the Object 430U was better than serially produced IS-3 and IS-4 heavy tanks and also the heavy experimental Object 730. As a result of the Object 430U, it was demonstrated that not only do the medium tanks have development potential, they can also achieve and surpass the parameters of heavy tanks. However, at this stage, the development of the Object 430U was stopped: by its parameters, it was effectively a heavy tank and the Soviets already had a post-war heavy tank program (which resulted in T-10) and didn’t need another one. Diese Seite wurde zuletzt am 7. August 2018 um 07:44 Uhr geändert. Diese Seite wurde bisher 23 mal abgerufen.